It was wonderful to meet again with my plein air class. Returning students were encouraged to bring a sketch for a critique since we would not be painting on this first day of the fall semester. It can be hard to put up your art work for group feedback, but feedback helps us learn. Starting off the semester with a critique set an expectation for serious work and heightened my anticipation for the learning we will do together. The facial expressions that people make while they are learning fascinate me and I was grateful that I had a chance to observe and sketch the body language of my classmates as we organized for a semester of learning. Their open mouths, slack faces, hands on the neck or face, arms hugging and quiet bodies are the same indicators of learning that I used to see in middle school before I retired and show how much my classmates and I want to learn from our teacher. I began this sketch with pastel pencils in class and this evening added more color with gouache paint. I sketched in a 12 X 12 inch Derwent sketchbook. 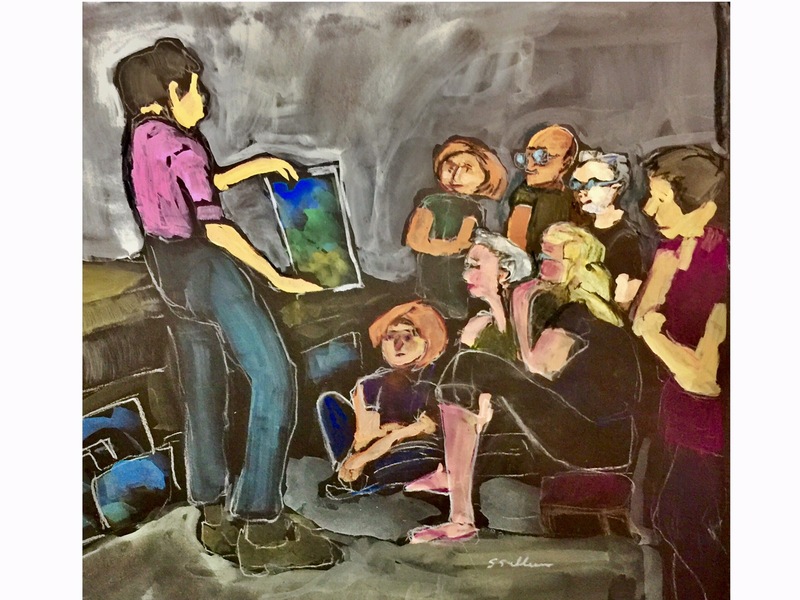 This entry was posted in Body Language, Groups Interacting, Learning, People Learning and tagged Body Language, Emoting, Gouache, Learning, Line, Pastel, San Diego. Bookmark the permalink.